The Duke of Gloucester continued through New Zealand (see also 19 Dec. 1934) and the RNZAF made special flights to deliver mail and papers to the Royal Tour party. Public mail was not accepted and only a few covers exist. Flight Wellington-Hokitika by Flight lieutenant M.W. Buckley in a RNZAF D.H.60 Moth. Flight from Wellington to Longbeach Station by Flight Lieutenant M.W. Buckley in a RNZAF D.H.60 Moth. Flight lieutenant H.B. 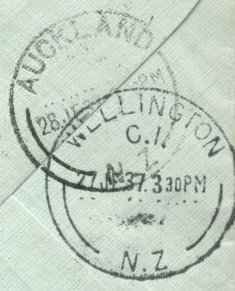 Burrell flew mail from Wellington to Christchurch. Flying Officer R.G. Russell flew from Auckland to the Bay of Islands. Flying Officer R. Russell flew from the Bay of Islands to Auckland. Flight Lieutenant S. Wallingford flew from Wellington to Auckland where Lieutenant L.J. Sylvester RAN flew the mail to HMAS "Australia" at the Bay of Islands. Lieutenant L.J. Sylvester flew mail to Auckland where he handed it over to Flight lieutenant S. Wallingford who took it to Wellington. On this date East Coast Airways Ltd. inaugurated their Gisborne-Napier passenger air service using twin engined D.H.84 Dragon II aircraft. The pilot on the first flight was Capt. T.W. White who was subsequently assisted by Mr. R. Kirkup as second pilot. The aircraft used on the service were: ZK-ADR "Huia" and ZK-ADS "Tui". East Coast Airways issued special commemorative covers for the occasion and these were distributed through the principal post offices. Permission to carry an official air mail was granted for the first flight only and it was nearly two years before the airline carried regular air mails [see Dec.7 1936]. The special covers carried the crest of the company together with the inscription: "EAST COAST AIRWAYS LIMITED-TWICE DAILY SERVICE-GISBORNE TO NAPIER & VICE VERSA-FIRST LICENSED PASSENGER AIR SERVICE IN NEW ZEALAND". An air mail etiquette was also imprinted in the top-left corner together with the caption "FIRST DAY COVER", the whole being in deep bronze-blue ink. The combined postage and air mail fee was fixed at 3d per oz. The service was suspended in March, 1936, for extensions to the Gisborne Air Field. "Double First Flight" covers are also known from this service and these carry double postage, bearing the Gisborne postmark of "6-AM", the Napier backstamp "16.AP.35.9-30 AM" together with the Gisborne backstamp "16.AP.35-12.30 PM". Although this flight was reported it is uncertain if mail was actually flown from Bruce Bay or taken to Haast or Okuru and picked up on that service. A cover has been seen postmarked BRUCE BAY S AU. 35 1 and signed by Captain J.C. Mercer. Overseas Flight: 1935, 19 Oct.
Was inaugurated on 30 December using the Dragon Rapides, ZK-AED "Venus" and ZK-AEE "Jupiter". No official mail contract had been granted to the company but small quantities of covers were flown 'by courtesy' on the 30th and some subsequent dates. 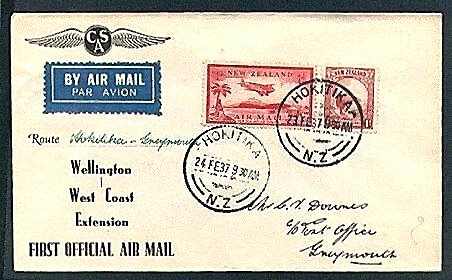 (Official mail flights commenced on 16 March 1936). Inaugurated its air service with an official opening at Milson Aerodrome, Palmerston North when the Minister of Defence, The Hon. F. Jones, dispatched the D.H.86 Express, ZK-AEF "Kotuku" flown by Commander A.G. Gerrand with Second Officer C.M. Duthie as co-pilot to Dunedin and return via Christchurch and Blenheim. The D.H.86, ZK-AEG "Karoro" returned from Dunedin, where it had been positioned on the previous day, to Palmerston North during the ceremony. No official mail was flown but some covers were carried 'by courtesy'. Inaugurated their first regular passenger service with the D.H.86 Express ZK-AEG "Kororo" (Commander KG. Gerrand and Second Officer C.M. Duthie) No official mails were carried but covers were flown "by courtesy". 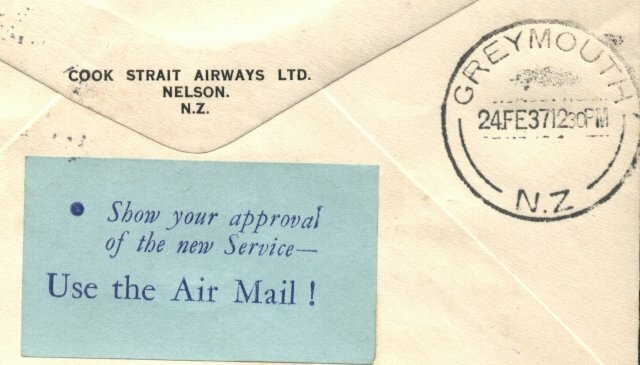 Just three months after the commencement of the regular passenger service over the trunk route, the first regular official air mails were carried under contract with the Postal Department. The postage rate was fixed at 2d per oz. including the airfare. Mails were handstamped and backstamped for the first week of the service. The planes and crews on the first flights were as follows: Dunedin-Palmerston North D.H.86 Express ZK-AEH "Korimako" under the command of F/L A.G. Gerrand with 2nd officer K.A. Brownjohn. Palmerston North-Dunedin D.H 86 Express ZK-AEG "Kororo" under the command of F/L G.R. White with 2nd Officer M.C. MacLeod. No official covers were issued but several types appeared from private sources. One of these carried the following inscription: "BY AIR MAIL Regular Inland Air Services-First Flights 16th March, 1936 Route......Per UNION & COOK STRAIT AIRWAYS INLAND SERVICES." Another carried the following: "UNION AIRWAYS OF N.Z. 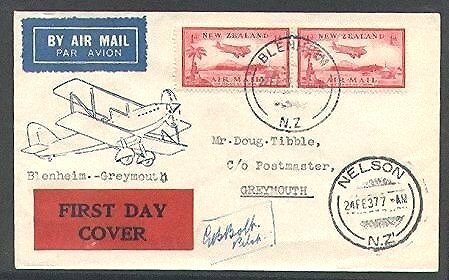 MAIN TRUNK SERVICE-FIRST OFFICIAL AIR MAIL, MARCH 16th 1936" while in a vertical panel on the left of the cover was the route: "PALMERSTON NORTH-BLENHEIM-CHRISTCHURCH-DUNEDIN and VICE VERSA". Commenced an official Air Mail Service with the Dragon Rapide ZK-AEE "Jupiter" piloted by Captain G.B. Bolt. In the afternoon Captain R. Matheson flew the Nelson-Blenheim and Wellington-Blenheim-Nelson flights. Privately printed covers were flown. Connecting Air Mail services. 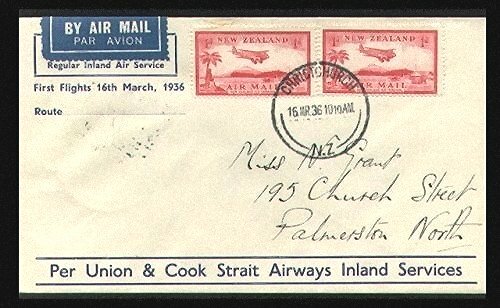 With the inauguration of Union Airways and Cook Strait Airways Air Mail services it was possible to have covers carried by all three companies. One of the special printed covers depicted the badges of each airline and was signed by Commander KG. Gerrand (UAL) Captain G.E. Bolt (CSA) and Captain J.C. Mercer (ATL). As both Union and Cook Strait Airways operated daily services including Sundays, the Postal Department took advantage of the Sunday services to dispatch mails. Unfortunately weather conditions were not favourable with the result that several flights were cancelled. No mails were carried from Wellington to Blenheim and consequently connections with Union Airways for Christchurch, Dunedin and Palmerston North were not made. F/O R. Matheson made all the Cook Strait Airways flights in the DH Dragon Rapide ZK-AEE "Jupiter", the Palmerston North-Dunedin flight by Union Airways was made by DH 86 Express ZK-AEF "Kotuku" commanded by chief pilot B.A. Blythe with co-pilot A.V. Jury. The Dunedin-Palmerston North mails were carried in DH 86 Express ZK-AEH "Korimako" commanded by D.H. Duthie with co-pilot M.C. MacLeod. Some special covers were used on this occasion and read: "BY AIR MAIL Regular Inland Air Service FIRST SUNDAY MAIL 22ND MARCH, 1936 Route...- Per Union & Cook Strait Airways Inland Services." These covers were printed in green on white. [Note] Although the mail for Blenheim and Christchurch was officially reported as being over-carried to Dunedin, examples have been seen backstamped at 2.00pm and 10.00am respectively, which may show that some bags were correctly delivered. Interrupted Mail through bad weather Mail stamped with AIR SERVICE INTERRUPTED cachet in purple. Simmonds Spartan ZK-ABK piloted by Arthur R. Craig flew a small mail from the new Birch Hill Flat Aerodrome, near the Mount Cook Hermitage Hotel, to Timaru. 36 letters including envelopes showing an illustration of the Heritage were postmarked HERMITAGE 3 MY 36 and again at TIMARU 4 MY 36 1 AM and are signed by Craig. With D.H 86 Express ZK-AEF Kotuku" (Commander A.G. Gerrand). 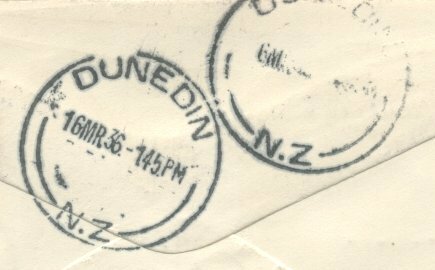 A mail of approximately 800 covers were flown into Invercargill and 1,600 carried on the return to Dunedin. Interrupted flight by Union Airways of NZ. D.H 86 Express ZK-AEG "Karoro" (Commander G.R. White with Second Officer K. Brownjohn) was forced to land at Saltwater Creek airfield, Timaru, by deteriorating weather. The passengers and mail were taken on to Dunedin by bus. No cachets were applied to mail. By ZK-AEG "Karoro" flown by Commander G.R. White and Second Officer K. Brownjohn after the emergency landing at Saltwater Creek, Timaru. 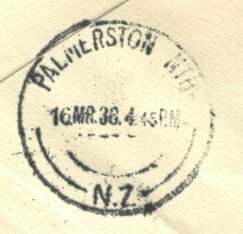 At least two covers are known to have been postmarked TIMARU 24 JLY 36 and flown to Palmerston North where they were backstamped PALMERSTON NORTH 24 JLY 4-PM. Interrupted flight when the Union Airways D.H.86 Express ZK-AEG "Karoro" was again forced to land at Saltwater Creek airfield through deteriorating weather conditions further along the route to Dunedin. Passengers and mail were transported to Dunedin by bus and no identifying markings were applied to mail. Flights were interrupted by bad weather in the north of the South Island. 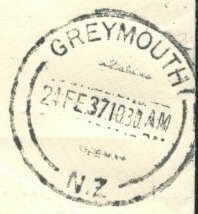 Nelson-Blenheim-Christchurch mail was stamped with the AIR SERVICE CANCELLED cachet in red. Overseas Flight: 1936, 22 Aug. Flight on the morning of the 7th from Wellington was abandoned through bad weather in the Cook Strait area. Mail was stamped with the AIR TRIP CANCELLED cachet in purple. Overseas Flights: 1936, 25 Sept. / 1936, 29 Sept. / 1936, 15-16 Oct. Interrupted mail Cook Strait Airways/Union Airways flight was cancelled because of severe turbulence over Cook Strait. Mail was stamped with the AIR TRIP CANCELLED cachet in purple. Was commemorated by an Air Pageant at which D.M. Allan flew an Auckland Aero Club D.H. Moth carrying approximately 15 special printed covers which he signed and posted at Te Kuiti after the flight. Overseas Flight: 1936, 15 Nov.
Inaugurated a regular air mail service with a D.H.84 Dragon after being granted a contract by the Post Office. (A special Air mail had been flown on the inauguration of the service on 16 April, 1935 for that day only). Interrupted flight caused by bad weather in Cook Strait. Nelson mail received the AEROPLANE TRIP CANCELLED cachet. S.L. Gilkison of the Southland Aero Club made a special Christmas Air Mail flight in the Club's D.H. 60GIII Moth Major ZK-ADM. Dunedin-Invercargill mail included letters held at the respective Post Offices at the time with some covers having endorsements and the pilot's signature. Interrupted flight of Cook Strait Airways / Union Airways. Cook Strait Airways Dragon Rapide ZK-AEC "Mercury", piloted by Captain G.B. Bolt had made a survey flight from Nelson to Greymouth earlier in the day and a few covers were carried unofficially by Captain Bolt back to Nelson after the opening ceremony. On 23rd February, 1937, a Dragon Rapide of Cook Strait Airways Ltd left Nelson to inaugurate the thrice weekly service to Greymouth and Hokitika, but after flying as far as Farewell Spit the pilot decided to return to Nelson owing to adverse weather. Mail that had centred on Nelson for the inaugural flight was re-datestamped at 7.00am on the following morning, February 24th and at 8am the D.H Dragon Rapide ZK-AEW "Mars" piloted by Capt. G.B. Bolt took off from Nelson and after following the coastline, which lengthened the flight by 1 hour, arrived safely at Greymouth at 10.00am, the flight being continued to Hokitika at 10.16am. The return flight began at 10.45am, left Greymouth at 11.15am, and continued to Nelson without interruption. It is interesting to note that the whole of the mail which left Nelson on the 23rd was, because of the return of the plane to Nelson, brought into the "Interrupted" class, but no "Interrupted Flight" cachets were applied. This of course, does not apply to mail posted after the plane left on the 23rd. Fortunately, the postal officials at both Greymouth and Hokitika also re-dated all mail received for the first flight. As Cook Strait Airways was operating the triangular Cook Strait service, it was possible to dispatch through mails by C.S.A. from Wellington and Blenheim to Greymouth and Hokitika, whilst at that point the service connected with Air Travel (N.Z) Ltd to South Westland. Mails from Wellington and Blenheim connecting with the first flight closed at Wellington at 4.00pm and Blenheim at 3.30pm on the 22nd and were flown to Nelson later that afternoon, whilst mails from Hokitika and Greymouth for Wellington and Blenheim were carried right through on the 24th, being backstamped at Wellington at 3.00pm and Blenheim at 5pm. Covers have also been seen which were posted at Dunedin on the 22nd, flown to Blenheim by U.A.L., Blenheim-Nelson-Hokitika by C.S.A. and Hokitika to South Westland by Air Travel (N.Z) Ltd.
SPECIAL FLIGHT WELLINGTON HMS "ACHILLES"
Flight by the ship's Supermarine Walrus amphibian K5774 flown by Lieutenant T.P. Coode RN carrying mail and despatches. Cover seen has the oval ship's handstamp and is signed by the pilot. Postmarked WELLINGTON C.1. 2MCH37 2.30PM. Overseas Flight: 1937, 21-28 Apr. Cook Strait Airways flight by a Dragon Rapide piloted by R.A. Kirkup, which was forced to return to Wellington by bad weather in Cook Strait Mail was stamped in red with the ....AEROPLANE TRIP CANCELLED cachet. A small mail was flown by the Wellington Aero Club Miles M2Y Hawk ZK-AEQ. Survey flight by Union Airways in Lockheed Electra ZK-AFD, "Kuaka" (Chief Pilot B.A. Blythe with Commander C.M. Duthie). No official mail was flown but a small number of covers were carried 'by courtesy'. 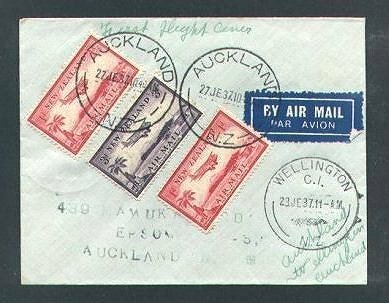 Some specially printed covers were flown and postmarked NEW PLYMOUTH 19 JE 37 and AUCKLAND 18 JE 37. Although inaugural functions were held at all points on the route on June 26th the actual first public flights and first official air mails were carried on the 27th of June, when the following aircraft were used: Commander C.M. Duthie and 2nd. Officer W.J. Peel flew ZK-AFD "Kuaka" from Wellington to Palmerston North, where Commander B.A. Blyth and 2nd. Officer E.A. Robinson took over for the flight to Auckland via New Plymouth. On the Auckland-Wellington flight the Lockheed Electra ZK-AFC "Kotare" was flown by Commander G.R. White with 2nd. Officer P.A. Matheson. As with the other existing inland air mail services the postage rate was fixed at 2d per oz. inclusive. 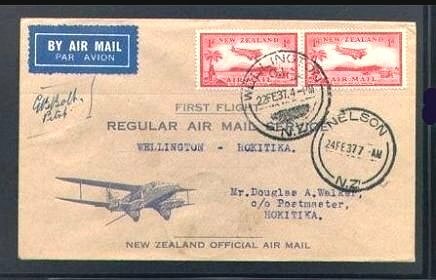 Covers were handstamped and backstamped in most cases on the first flights, but unfortunately the Wellington-Palmerston North mail was overcarried to Auckland and should therefore be classed as Wellington-Auckland section. It was at first, thought that the same fate had befallen the whole of the Wellington-New Plymouth mail, but it was later found that a portion of this mail was carried correctly, being backstamped New Plymouth "27 JE 37.2.30 PM". Several types of special covers were used on the first flights. Several different privately produced covers have been seen. D.H.86 Express ZK-AEH "Korimako" (Commander A.V. Jury with Second Officer D.C. Campbell) flying the northbound South Island service from Dunedin now connected with the Lockheed Electra service to Auckland at Palmerston North. Mails backstamped 2.30 at New Plymouth and 4.00pm at Auckland. Southbound Lockheed Electra from Auckland connected with the D.H.86 Express ZK-AEF "Kotuku", Commander H.L Tancred with Second Officer D.C. Campbell, at Palmerston North. Connecting with Union Airways and Cook Strait services. With the new Lockheed Electra service in the North Island and the Cook Strait Airways connecting flights to Hokitika, Air Travel (NZ) Ltd could fly the mail on their South Westland service. Covers are incorrectly backstamped 26 JE 37 as the mail was not received at Hokitika until 29 June 1937. The quantities of mail are not recorded. Of Cook Strait Airways Dragon Rapide ZK-AEE "Jupiter", Captain A.T. Orchard. The aircraft taxied on to soft ground at Hokitika and tipped on to its nose, sustaining minor damage. No mail has been identified. Unscheduled flight by Union Airways D.H.86 Express that had been forced by bad weather to land at Rongotai Airport while on a regular Palmerston North-Dunedin flight on 1 September. (This was the first landing at Rongotai of a D.H.86). The following morning the D.H.86 flew to Christchurch carrying an air mail which had closed at Wellington at 8.30am. At Christchurch these letters were backstamped 2SP.37 12 AM. Very few examples now exist. Extension of East Coast Airways Ltd regular service by Captain T.W. White, flying the D.H. Dragon ZK-ADS "Tui". This schedule enabled passengers and mails from Gisborne and Napier to connect with the Union Airways service. Service by Union Airways of N.Z. using Lockheed Electra's. The letter mail from Palmerston North (4), Napier (18), Gisborne (91), Wellington (105), Nelson (32), Blenheim (17), Dunedin (63) and Christchurch (254) made up the bags of 584 items flown to Auckland. With the inauguration of the ECA Gisborne-Palmerston North regular service it was possible to send letters by air mail from Gisborne to Okuru at an 'All up' rate. Special 4-colour covers bearing the badge of each airline and the pilot's names (ECA T.W. White, UAL G. Harvey and G.R. White, CSA S.L Gilkison and ATL J.C. Mercer) and all were addressed to Captain F.W. Crawford. Another important step forward in connection with the "70% AIRWAYS INCREASE" was the duplication of the Auckland-Wellington service by the addition of the direct flight mentioned above. This allowed the flight via New Plymouth to leave earlier and so connect at Palmerston North with the D.H.86 Express for the South Island, thus giving the first one-day service from Auckland to Dunedin. Mail carried from Auckland and New Plymouth to Dunedin on the first through flight was backstamped "31.OC.37.3.30.PM". Some special covers were issued from a private source for this flight and were inscribed as AIRWAYS of New Zealand follows "UNION AUCKLAND to DUNEDIN FIRST ONE-DAY SERVICE Route....to....". This was printed at the top of the cover in blue. The chief pilot on the Auckland-Palmerston North Electra was Commander G.R. White. WELLINGTON-CHRISTCHURCH INTERRUPTED FLIGHT BY COOK STRAIT AIRWAYS / UNION AIRWAYS. Cover reported postmarked WELLINGTON RAILWAY STATION 19 NO 1937-1 addressed to Christchurch with boxed AIR SERVICE INTERRUPTED cachet in red. From Palmerston North at the beginning of the Diamond Jubilee celebrations. Messages were dispatched by pigeons to the Mayors of a number of towns as far apart as Blenheim and Whangarei. The message reads PALMERSTON NORTH DIAMOND JUBILEE -NOVEMBER 20th to 27th 1937 - A.E. Manson, Mayor, Sends -Greetings to Your Mayor - H.E. BENNETT, Organiser. Overseas Flights: 1937, 20 Nov.-5 Dec. / 1937, 3 Dec.-1938, 24 Feb. / 1938, 2 Jan.
Service by East Coast Airways Ltd using the D.H. Dragon ZK-ADS "Tui" flown by Captain T.W. White. This trial service enabled connections to be made with Union Airways at Palmerston North but was discontinued after 5 weeks. Air Travel (N.Z) extended its South Westland service to Jacksons Bay using the D.H. Fox Moth ZK-ADL. Only very small mails were carried. Cook Strait Airways/Union Airways. ....AEROPLANE TRIP CANCELLED cachet applied in purple to covers which did not reach Christchurch until the 6th. Flight of Union Airways. Mail was stamped with the framed AIR SERVICE INTERRUPTED cachet in purple. This mail was not delivered in Christchurch until 7 February. BLUFF-HMS "ACHILLES" IN MILFORD SOUND. The ship's Supermarine Walrus amphibian K5774 flew from Milford Sound to Bluff to pick up mail. No covers reported. Overseas Flight: 1938, 15 Mar. CRASH OF THE LOCKHEED ELECTRA ZK-AFC "KOTARE"
(Commander C.M. Duthie with Second Officer W.J. Peel) soon after take-off from Mangere aerodrome, Auckland en route for Wellington. There were no passengers but both pilots were killed and the estimated mail of 180 letters was destroyed. First Flights by Union Airways service with D.H.86 ZKAEH "Korimako" (Commander T.W. White with Second Officer LD. Loasby) flying Gisborne-Hastings-Palmerston North. D.H.86 ZK-AEG "Karoro" (Commander by T.W. White with Second Officer R.M. Stewart) made the return flight. Privately printed covers were flown. Flight by Cook Strait Airways / Union Airways. 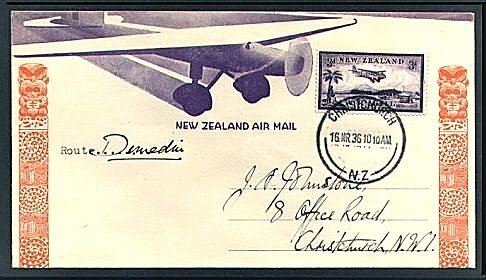 Mail was stamped with the 'AIR SERVICE INTERRUPTED' cachet in purple and was received in Christchurch on 16 September. Which was located on the property of Mr M.B. Youngman at Darfield. Small mails were flown by two pilots during the celebrations and approximately 12 covers were postmarked DARFIELD 29OCT.38 4.15PM. GISBORNE-PALMERSTON NORTH-CHRISTCHURCH & VICE VERSA. Union Airways began a regular same day service with DH86 Express aircraft. Gisborne-Christchurch. The Lockheed Electra replaced the DH86 Express on the section between Palmerston North and Dunedin. National Air Mail Exhibition was held in the Builders' Chambers, Christchurch with a large entry of N.Z. and International collections. At the Exhibition Post Office a commemorative "Winged" cancellation was in use over the three days. Special souvenir covers were printed for the Society and a limited number of photo postcards were also issued. Were organised by the Air Mail Society of N.Z in conjunction with its National Air Mail Exhibition to mark the 40th Anniversary of the Great Barrier Pigeongram Service. 500 special 'Flimsies' were flown by pigeon from Rangiora to Christchurch and taken to the Exhibition where they were placed in special envelopes and posted at the Exhibition Post Office. Overseas Flights: 1938, 21-27 Nov. / 1938, 3-12 Dec.